Once again, yet another photography experiment. This time: What is the aperture range of a human eye? I took the average naked human eye, without any contact lenses, perfect 20/20 vision. Aye, it was I! 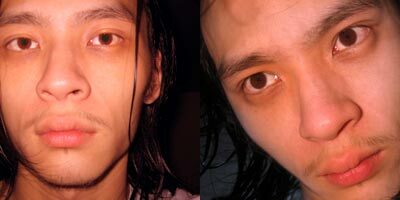 Left: In the darkness, my iris opened, making my pupil wider. I flashed to take a picture. The aperture was calculated by measuring the diameter of my iris (109 pixels on the original image) and the diameter of my pupil (63 pixels). 109 divided by 63 gave an aperture of F1.73. Right: I pointed a table lamp at my face and took a picture without flash. This was F4.48. Thus, I could conclude that my range was approximately 3 stops. What about shutter speed? It is said that humans can only really distinguish up to 30 frames per second. This entry was posted in Geek, Pictures on November 13, 2005 by 2konbla.